A trippy mixture of prog, rock, jazz, indie, punk and emo – math rock has a bit of everything going on. And yet it has a code, a discipline, a formula that creates its own paradigm. You hear this in other genres to a lesser or greater extent – surf, punk, classical (OK not so much that last one). And like surf, this makes traditional ‘songs’ less common, with even vocals often used in an unconventional way, almost as a part or theme of the song, rather than the central element they more usually are. For aficionados this is no bad thing, but for those with more vanilla tastes, it might be a bit challenging. 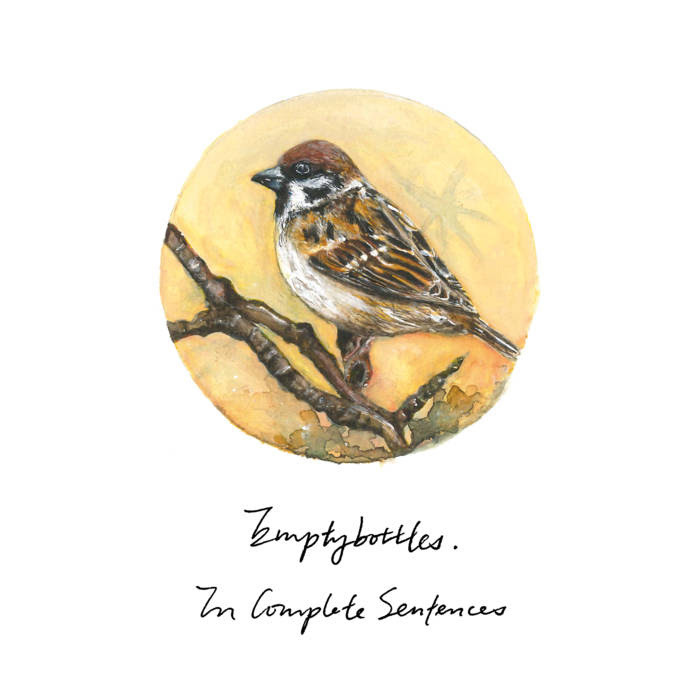 Hong Kong, however, has proved a happy home for math, and this excellent new EP, recorded mid to late 2016, “In Complete Sentences”, the second by Emptybottles, is a worthy new contender. Put out mid-August as a co-release from Sango Records and Sweaty & Cramped, the band – Thomas, Cha Bao and Lok – say that like the first EP, it was “recorded during a time of struggle, but we are glad our trusted friends helped us finish the record”. Comes in with a very modern, jazzy feel, slightly atonal, until a minute in it goes all indie-rock which makes quite a contrast, accompanied by a screamo-in-the-background vocal before stopping dead in its tracks. Clever, confusing, contrary – so far, so intriguing. Super melodic, almost funky, with beautiful contrasting guitars – one rhythm, one lead, sliding and shaping in and out of each other. Gradually builds with the lead guitar becoming almost stratospheric, while never losing that gorgeous timing and balance. Breathtaking. Two more sparring guitars, with a rat-a-tat drumming intro, fluid, entrancing, instrumental magic. Somehow driving along at its own perfect pace oblivious to the rest of the world. Again builds up, becoming heavier, but in a totally organic way. Then, unlikely – a trumpet solo enters the fray. Things slip into half-time (is it? Or 6/8? This math stuff is a bit beyond me), the trumpet holds the same few delicate notes before it all fades out, leaving nothing but fabulous ethereal wisps in its trail. Again that fresh, summer-like vibe with just a hint of wistfulness, like watching a perfect sunset after a wonderful holiday, knowing you’re back to reality the next day. The heavier feel and soloing, which is something of a trademark comes in again. Those beautiful harmonic guitars are again present and correct, twisting and shimmering, almost an Afro-beat to some of its harmonies and structures before taking it right down and building it up again. The band describes the track as “perhaps their most ambiguous composition so far”. This is lovely, inspired stuff, with wonderful playing and dreamy soundscapes which create their own special rock cosmos. My one observation might be that the vocals come across as something of an afterthought but that’s only in the context of ‘standard’ song writing, which this isn’t, as discussed earlier.